Hey all, my name is Robert. 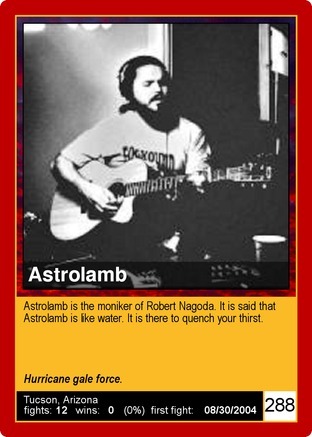 I used to do some songfighting as "astrolamb" back in 2004-2006 and now I'm back for more. If any of you remember the astrolamb submissions you may be recoiling in horror to see the name pop back up since I tended to submit poorly conceived and recorded tracks that didn't fare well, but it was a lot of fun and hopefully I've improved at least a small amount in the past decade. Really great to see this is still happening. I'm going to start with "Tyson's Corner" even though I haven't the foggiest idea what to so with the title. I guess that's the point, though. Thanks - it's good to be back! I would recommend writing a song about Mike Tyson beating people up and shoving them in a corner! Just kidding, that might be too graphic for you. Welcome aboard! Welcome back! Have you seen your trading card? Niveous wrote: Welcome back! Have you seen your trading card? Ha! Alright - that's kinda fun!